We hope you’ve been having a nice start to the new year. I’ve been hearing much talk of resolutions, many of them for a healthier diet and all kinds of cleanses. We surely weren’t immune to holiday eating and have been trying to lighten things up, primarily with the help of salads and veggie juices. But even when taking it easy, I have to have some kind of nourishing treat on hand. You know, in case of an emergency. 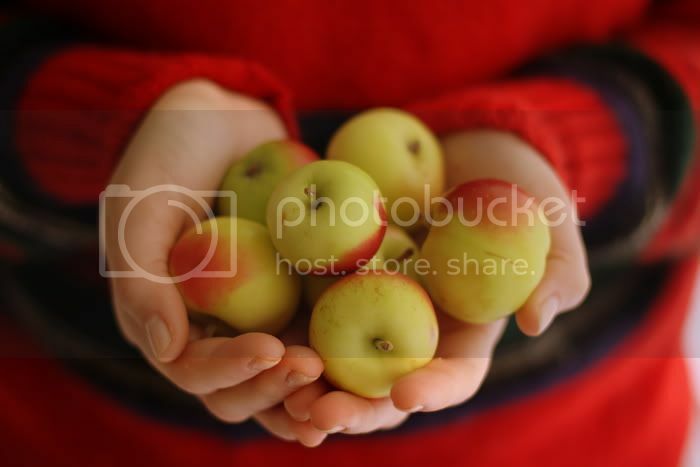 The other day, I found these lady apples at the market. Tiny, blushed things staring at me from the shelf. Given their size, I figured they would make a nice cookie topping. Another thing we’ve been enjoying this season – fresh cranberries. I decided to top the cookies with fresh cranberry jam, followed by vanilla honey soaked apples. After the dehydration, the soaked apples turned out so tasty that I thought they would make very nice apple chips. This time, the cookie itself was made of buckwheat only. I usually mix in other grains like oats, but I really wanted to try this kind of dough. I love buckwheat and use it all the time. It’s such a versatile, delicious, and wholesome ingredient. And I really enjoy the fact that it isn’t technically a grain, but a fruit or berry, which makes it that much better. 1/2 cup Irish moss gelTo make Irish moss gel, rinse Irish moss thoroughly and soak in hot water for at least 10 minutes. Blend in a high-speed blender with enough purified water to reach a smooth gel-like consistency. Keep refrigerated. To make the jam, blend all the ingredients together in a high-speed blender until smooth. Keep refrigerated. Slice lady apples thinly and place in a dish, drizzle with freshly squeezed lemon juice. Scrape seeds from a vanilla bean and add to the apples. Drizzle with raw honey and stir to cover. Leave to soak for 1-2 hours. To make buckwheat flour, soak raw buckwheat groats overnight, rinse well, and dehydrate at 115F until completely dry. Grind in a high-speed blender, or in a simple coffee grinder in batches. Keep refrigerated in an air-tight glass container. To make cookies, sift together the first two ingredients in a large bowl. In a high speed blender, mix the rest of the ingredients until smooth, adding more water if needed. Add the wet mixture into the dry mixture, combining well. Using a wet spoon, fill about 1/4 of a small silicone or paper cup with the cookie dough. Wet your fingers to even out on top, or use a wet spoon. Continue until all dough is used up. 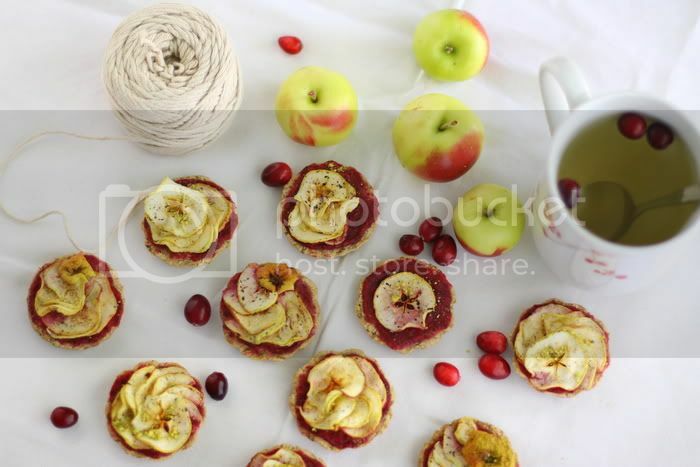 Top each cookie with the raw cranberry preserve and arrange vanilla honey soaked lady apples in a spiral on top. Place the cookies in the dehydrator set at 115F for 2-4 hours, until they can be easily removed from silicone cups. Then dehydrate for another 6-8 hours. I love your blog! Your food is just gorgeous, however, a lot of it has many of the same ingredients, I know when I eat the same thing over and over again I get bored of it. How do you overcome that? 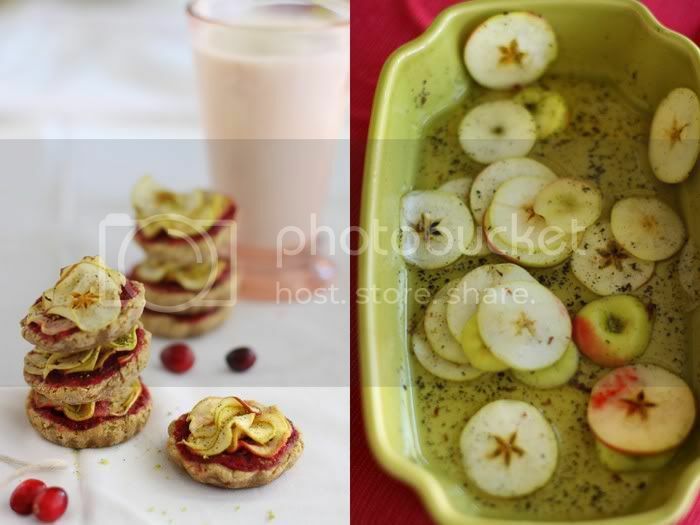 Love all your recipes…and the photos are beautiful. What a gorgeous and different cookie!!! 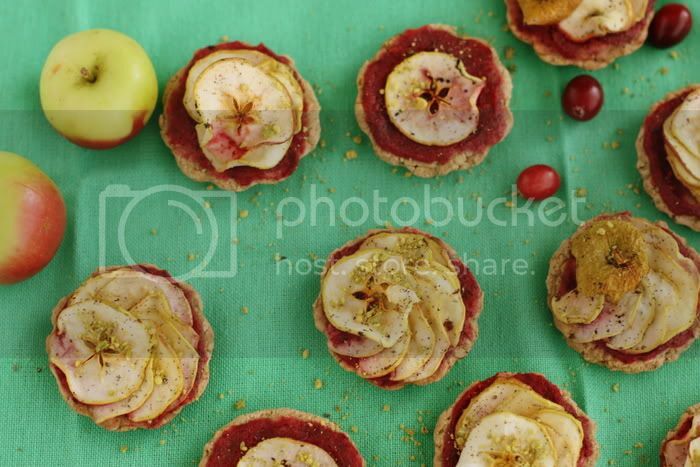 I love the topping of fresh cranberries and apples. So delicious! Thank you for this article, very helpful for what I want to know about raw honey. ah! can’t believe how great your recipes are! love it. I’m making these cookie! I haven’t worked with irish moss yet, but have some waiting to be used. I’m in love with your blog and these cookies. Thank you so much for such unique, beautiful recipes. Happy, healthy 2012 to you and the family, Golubka! I see you’re picking up right where you left off. The cookies look and sound wonderful, can’t wait to try them out. Thanks, as always, for the ideas, inspiration and food that takes LOVE. Yochiebee, I get bored when eating the same thing as well. I experiment with different dishes all the time, and although the base ingredients may repeat, I try hard to make the final product new and exciting. Jenne, hope you like them!